The Wisconsin Initiative to Promote Healthy Lifestyles (WIPHL) and Transform Wisconsin have issued a call for applications for their CDC-funded Cardiovascular Prevention Enhancement Program (CPEP). CPEP aims to help Wisconsin clinics improve outcomes for their patients with type 2 diabetes, hypertension or lipid disorders. Transform Wisconsin and WIPHL will select up to six Wisconsin clinics to participate. Ideally, at least two clinics will be located in rural counties. The application deadline is February 28, 2014. Satisfy dozens of NCQA Patient-Centered Medical Home recognition criteria. Improve performance on several WCHQ and CMS Accountable Care Organization (ACO) quality measures. Generate shared savings for ACOs. Have a staff member trained in motivational interviewing. Gain an additional edge in competing for contracts. Take an important step toward delivering team-administered, value-based health care. Help prevent cardiovascular disease among patients with important risk factors. To download a more detailed program description click here. A program application is available here. For more information or to register for the webinars, e-mail Rich Brown, MD. 01. Recognizing change talk: If you listen closely enough,people often tell you their own motivations for change. One of the challenges in recognizing change talk is that it often comes intertwined with its opposite – sustain talk (a person’s arguments for not changing). A patient statement that includes that ambivalence might sound like: “I know my health would get a whole lot better if I quit smoking, and I’d save money, too, but I just don’t think I can do it right now.” The part that’s underlined is the change talk! Evoking is at the heart of Motivational interviewing. When we stand on the secure foundation of an engaged and collaborative relationship and have a shared focus, we can effectively partner with our patients to help them give voice to their motivation for change and then help support them while they put that motivation into action in the planning process. With only one month before enrollment opens for new exchanges and four months before new requirements for health plans take effect, most of us are wondering how the Affordable Care Act (ACA) is going to come together. Although polls show a wide range of opinion about the ACA and its implementation, almost everyone agrees that U.S. healthcare must be more effective and cost-efficient. Indeed, a Gallup poll earlier this year found that 81% of Americans personally worry either “a fair amount” or a “great deal” about the availability and affordability of healthcare. Within the healthcare industry, many individuals are concerned about how cuts will affect their sectors and yet few dispute our collective need to work toward the triple aim. That’s improving health outcomes, enhancing patients’ experience of healthcare, and controlling healthcare costs. Perhaps that’s why nearly 150 people in Wisconsin have already registered for WIPHL’s September Symposium on Behavioral Screening and Intervention (BSI), which is co-sponsored by the Wisconsin Collaborative for Healthcare Quality. To generate strategies and enthusiasm for overcoming those barriers. Our keynote speaker, John Torinus, author of the new book “Opt Out of Obamacare, Opt Into the Private Health Care Revolution,” will describe why large and medium-sized corporations are increasingly voting with their feet to leave the mainstream U.S. healthcare system and what it would take for them to return. During our free, day-long Symposium, I’ll review the need for BSI, its contribution toward the triple aim, WIPHL’s successful model of BSI delivery, and where BSI stands in Wisconsin. In addition, Mia Croyle, WIPHL’s Director of Development, will facilitate a panel discussion among diverse healthcare professionals whose clinics are systematically and successfully delivering BSI. Additional sessions will include more discussion on BSI delivery models, BSI-related policy issues, employers’ perspectives on BSI, coding and reimbursement and how BSI is linked with cardiovascular prevention, federally qualified health centers (FQHCs), educational settings, and mental health disorders. Speakers from across the United States will add a national outlook as well. The day will be full of opportunities for discussion, networking and planning next steps for dissemination of BSI. We’re fortunate our current grant from the Agency for Healthcare Research and Quality allows for registration, lunch and refreshments at absolutely no cost to participants. If you’ve already registered, we look forward to seeing you, and feel free to invite others. If you haven’t, please register here. For more information, refer to our Symposium agenda packet or email any questions and comments to info@wiphl.org. I believe an analysis of the trial by Essential Evidence Plus POEM, which stated the bottom line was that alcohol screening and intervention did not decrease the percentage of patients drinking to excess at six months, completely misinterpreted Kaner’s study. Kaner’s study did not assess the efficacy of alcohol screening and intervention, which is already well-established in dozens of randomized controlled trials, including Mike Fleming’s seminal study published in JAMA in the 1990s. Kaner’s study assessed the effectiveness of training physicians and nurses in primary care settings in delivering these services. And of course, the physicians and nurses did poorly, because they simply don’t have time to adequately screen and intervene. If you really want to generate the improved health outcomes and cost savings that alcohol screening and intervention will yield, you need to expand your healthcare team with staff who have the time to deliver these services. The same goes for evidence-based – widely-recommended, yet seldom delivered – evidence-based interventions for tobacco and depression. We can increase one-year quit rates from 6% to as high as 28% if we have additional staff who can spend as much as five hours with each patient over more than eight visits, according to a metaanalyses published in the most recent update of the Federal Guideline for Tobacco Cessation. If you have questions regarding Kaner’s study, the POEM analysis or my response to the POEM analysis, please email me at info@wiphl.org. For more information, see wiphl.org. 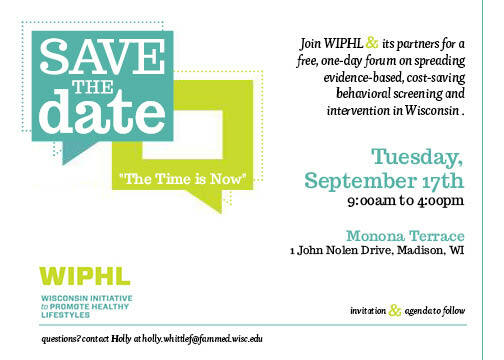 Wisconsin Initiative to Promote Healthy Lifestyles (WIPHL) announced the 2013 WIPHL Symposium on Behavioral Screening and Intervention (BSI) will be held September 17 at the Monona Terrace in Madison. The day-long event will be free and open to the public. More than 20 experts will deliver presentations on the importance of BSI services at the Symposium, including a keynote address by John Torinus, Chairman of Seriograph, Inc. and the author of the book, “The Company That Solved Health Care.” Presenters also include leaders from The Alliance, Business Healthcare Group, Council on AODA of Washington County, University of Wisconsin-Whitewater, Wisconsin Collaborative for Health Care Quality, Wisconsin Department of Health Services, Wisconsin Primary Health Care Association and various healthcare clinics across Wisconsin. More than 200 attendees are expected to take part in WIPHL’s Symposium. The event will offer panel, discussions, valuable presentations and networking opportunities to discuss the facilitators and barriers of implementing BSI in addition to encouraging the dissemination of the services in Wisconsin. To register and view the full agenda, visit http://onlinecommunity.wchq.org/event/BSIsymposium. BSI screens all patients annually by questionnaire for behavioral risks in general healthcare settings. These services are aimed at reducing tobacco use, unhealthy drinking, drug use, depression and obesity, which, in total, are responsible for more than 40 percent of deaths in the United States each year. For more information on BSI, visit www.wiphl.org.